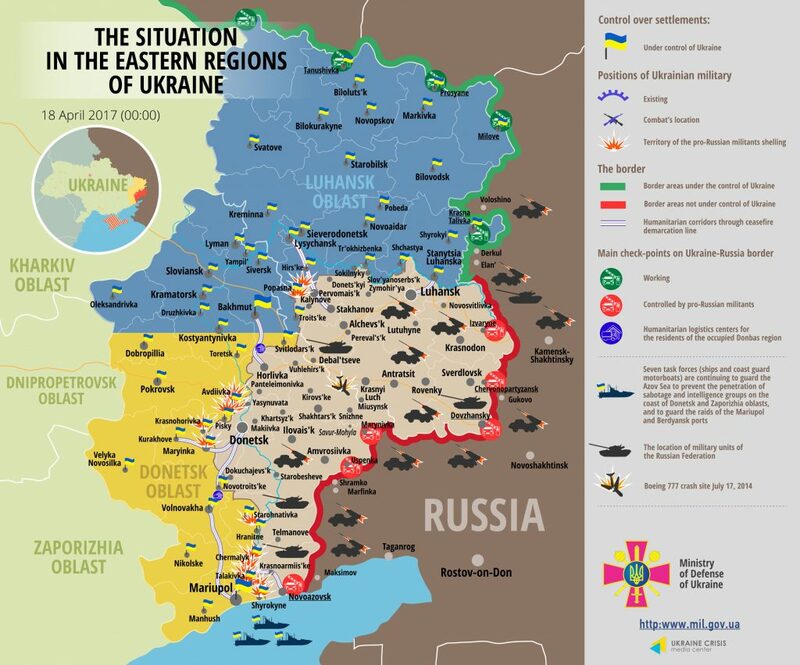 Main hostilities in Donetsk sector of ATO zone took place in Avdiivka and its vicinities. Militants were shelling Avdiivka in the afternoon using both light weapons and mortars. One 152-mm mortar attack at Ukrainian strongholds was registered. “Enemy’s aggressive actions resulted in yet new damages in local residential quarters. Mortar shells directly hit eight houses in Avdiivka and damaged them, and one of these building was completely ruined,” informed Ukrainian Ministry of Defense spokesman on ATO Colonel Oleksandr Motuzyanyk during a press briefing at Ukraine Crisis Media Center. Ukrainian repair crews are doing their best to resume power supply to the city, interrupted by yesterday’s enemy shelling. The situation was calmer near Avdiivka – in Shakhta Butovka position and in Kamianka. Two attacks took place in the evening, each lasting up to one hour, involving small arms and grenade launchers. Russian proxies conducted another 30-minutes-long armed provocation in Opytne. In Luhansk sector militants remain active in Popasna district, near Novooleksandrivka and Katerynivka, where militants opened fire at Ukrainian positions four times yesterday. “Militants used mortars in Katerynivka once, and light weapons were used in other cases,” said the spokesman. Militants conducted the largest number of attacks in Mariupol sector. They violated the ceasefire around midday in Maryinka district. Two more armed provocations occurred there in the evening and about 22:00. “The enemy conducted one mortar attack about 15:00 in the Volnovakha district, firing four mortar shells at our positions,” informed Col. Motuzyanyk. Militants were shelling ATO troops along the Chermalyk-Shyrokyne frontline from morning till late night. Russia-backed militants conducted two mortar attacks in Chermalyk and Pavlopil, and used snipers in Talakivka and Vodiane. Militants were actively using light weapons in other positions of this frontline, including armored vehivhles. In total, militants conducted 24 attacks in Mariupol sector yesterday, using mortars three times. Ukrainian Armed Forces incurred no fatal casualties yesterday, yet one soldier was wounded in a mortar attack at our positions in Chermalyk. Report on the military developments as of April 17 is available here. Interactive data on the shelling: chronology shelling chart and the interactive map.